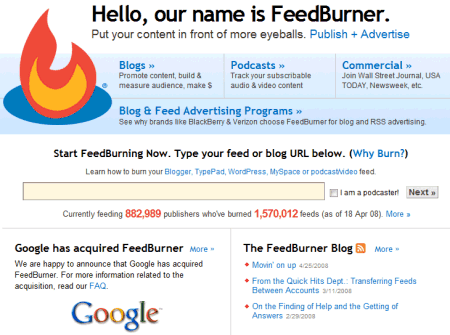 After Google bought FeedBurner in June 2007, we didn't hear too many new things about FeedBurner. A post from February detailed the benefits of the future Google integration: connecting with other Google services, better performance and new features. "Why not build new services and integrate at the same time? (...) Our perspective is that the time you lose trying to continuously merge an updated legacy codebase with a new rewrite causes you [to] be in a world of never actually getting the integration done because you're constantly working on merge problems." It seems that the Googlizied FeedBurner will be brought to life soon. FeedBurner Blog announces that "in the coming weeks, upon visiting www.feedburner.com, selected publishers will have the opportunity to sign in using their Google Account". That means you will be offered the option to choose a Google account as a new home for FeedBurner. The posts mentions that the integration with other services will be added gradually and it's easy to anticipate the relaunch of AdSense for feeds or a new tab in AdWords. The most visible side-effect of the Google ownership is that the premium accounts and MyBrand are free, so you might save at least $96/year. In the past 11 months, FeedBurner doubled the number of users and now has "882,989 publishers who've burned 1,570,012 feeds". Too bad that it doesn't work. I think you need to turn off "Convert Format" and "Smart Feed"
I disabled "convert format" and it still doesn't work. Anyway, FeedFlares use as an input the original feed converted in Atom 1.0 format, so it shouldn't matter if FeedBurner transforms them. It shouldn't matter, but it does. If "SmartFeed" and "Convert Format Burner" are turned off, enable "Blogger Comment Count" FeedFlare and give it a while to update. After a while, it'll show up. It has a lot of quirks, but I promise it really does work. Check out my feed if you still don't believe me. I found this discussion in FeedBurner's forum, so you're probably right. The comment flare still doesn't output anything, though. It would be nice of them to get the feed subscriber count sorted. It goes up and down like a yo-yo at the minute. Please revisit this topic now that Feedburner accounts are being moved to Google. It has been a disaster for many, and there seems to be no support. If anyone knows of a decent alternative to Feedburner's email option, please post. Thanks!